The place is an institution and has been satisfying the locals sweet tooth for decades. 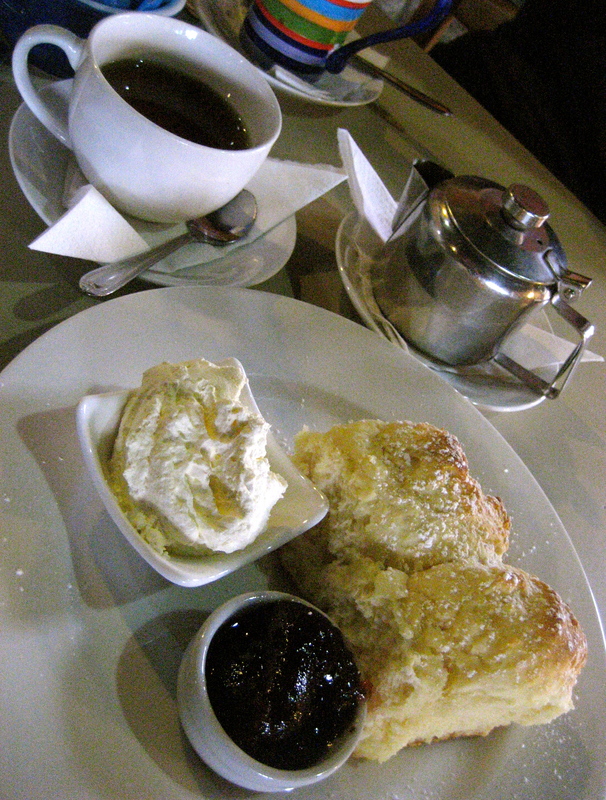 This is the second Devonshire Tea I have had at Annie’s, just to give them the benefit of the doubt. A firm favourite of mine for their to-die-for ice-cream, don’t be fooled by the blaring in your face Devonshire Tea sign on the shop awning. The scones are small and although microwaved, are okay. The cream is light but acceptable and there is insufficient jam. It is however better than what I expected. Instead come for the creamy delectable ice-cream and the pink and white booths. Love you Annie’s! Tea: Black standard tea bag in a small pot. Overall: Stop for the incredible ice-cream and kitsch decor if nothing else. Set in the lovely O’Connell Valley in between Bathurst and Oberon, Avenue Cafe is worth a stop or even a special trip if you are staying in the area. Stockists of Fish River Roasters coffee, the import office is next door, you can also pick up a loaf of bread and a few basics if you are strapped and not heading to any towns. It’s a relaxed and friendly hub with a choice of dining possibilities, either in, out, front or side. The scones are fresh, baked that morning, and share the display cabinet with a stack of other homemade goodies. The jam is tasty, the homemade type, and the cream, although fresh, is too lightly whipped for me – thick as you can, is the go! Open Friday to Sunday, 8.30am to 4.30pm. Tea: A range of loose-leaf tea and tea bags. Overall: A great stop which feels a long way from anywhere. I often chuckle when I see write ups in high-profile glossy travel magazines about the merits of Bathurst, and I wonder whether it’s the same place I have been visiting at least twice a month for the past five years. By visiting, I mean doing the mundane; grocery shopping, buying worming tablets for the dog or screws from Bunnings, it’s the service hub for Hill End 85 kilometres away. I have taken advice from these articles and lunched at Cobblestone Lane, which does indeed deserve merit, but you clearly pay for what you get – the same as anywhere. Then there is the rest of Bathurst and Banjo’s Cafe exists in this realm. The cafe is popular and inviting, sitting at one of the entrances to the older of the two Stockland Shopping Centres. The ‘hot scones’ are on the menu but this is the first time I have seen any in the cake cabinet as I pass by. The scone is dry and more like a bread roll, and I really can’t tell when it was baked – definitely not today. 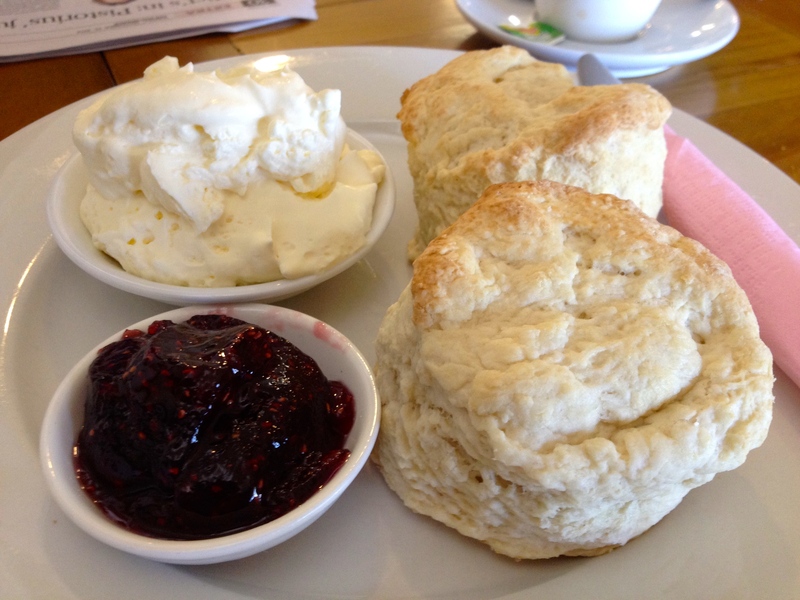 It is served with a sachet of jam, a big no no, and the cream is so light it melts before hitting the scone. Whether seven days in the country has muddled my brain, to me ‘white tea’ means ‘white tea’ (as in green, black, you get the picture – and I have a bunch of it at home). At Banjo’s, ‘white tea’ is listed under ‘tea’ but literally means ‘tea with milk’. So when my black tea, which smells a bit like Billy Tea, arrives with a side of milk, I am a bit confused. The girls behind the counter scratch their heads trying to understand what could possibly be wrong. All I can think of are those travel writers (I am often one of them) that breeze in to a place and see only the very best of what is on offer, but how about the other 99 per cent? Tea: A selection of loose-leaf teas served in a small pot. 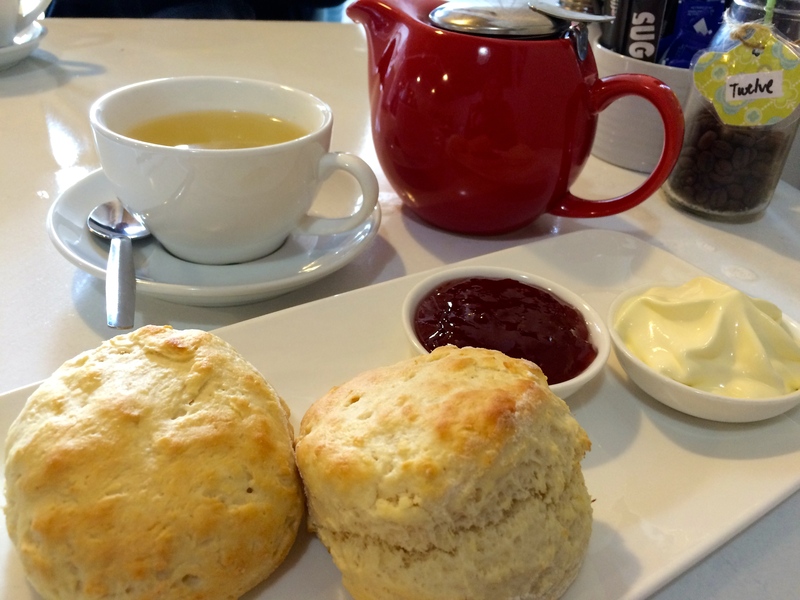 Overall: A popular and bright cafe but give the scones a wide berth. It’s my first visit to the Bathurst Farmers Market, and it’s happening simply because we are passing by. If I’m honest, I don’t do these types of markets. For one, I’m a freelancer, and for most of the month I don’t have any cash in my wallet, so it’s far easier buying food at a supermarket where they are happy to take plastic. Plus, many of these places can be expensive. The funny thing is, there never seems to be any farmers! Well, at this one I bought a $2.00 cabbage from a dinky di farmer who was selling them from a trailer; it’s good to see they are still about. Actually, I’m intrigued by the historic timber buildings built for the showground, that look as though they were built more than a century ago – probably more, considering the site has been used for agricultural purposes since Bathurst’s settlement in 1815. During my ‘building inspection’ I spy the CWA ladies lined up behind a swag of Tupperware containers. I’m spoilt for scone choice; plain, apple and cinnamon, pumpkin and rosemary, and cheese and chives. I stick to the sweet and go with a plain and an apple and cinnamon. As it is a Farmer’s Market, my scones are handed to me on a plastic plate, with a squirt of sickeningly sweet cream from a can, and a couple of sachets of jam. My plain scone has a five-star look but is a bit salty and rubbery from the zap in the microwave. The apple and cinnamon scone comes out in front in taste, but is quite small and chewy. The Bathurst Farmers Market is held on the fourth Saturday of the month. Tea: A surprisingly big range of tea bags served in a takeaway paper cup. Overall: Quite disappointing. I thought the CWA were the leaders when it came to scones. 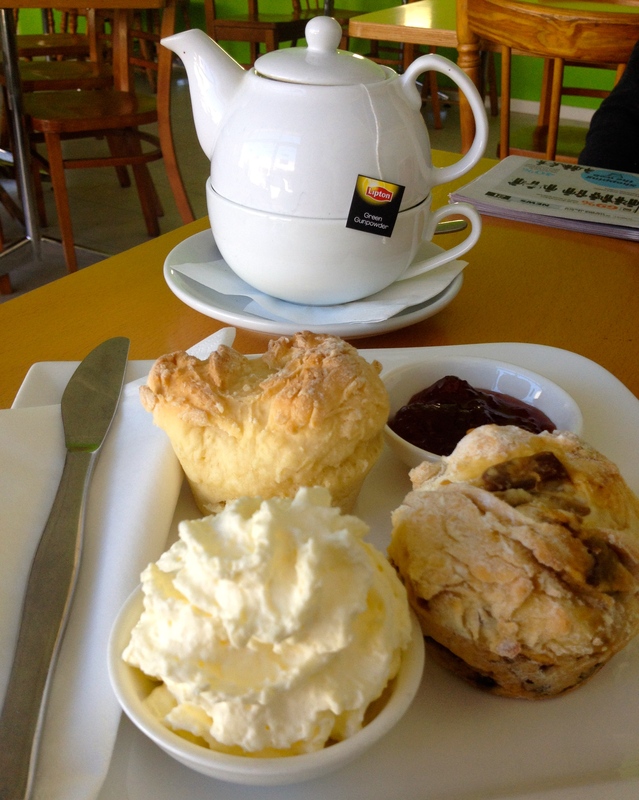 I find myself at Beck’s P & C Bakery in downtown Bathurst, and I am surprised to see Devonshire Teas on the menu. I have a foreboding feeling but feel obliged to give it a try. What’s a true guide without the good, the bad, and the ugly, right? The bakery is modern and large with seating upstairs, downstairs and out the front, and isn’t big on atmosphere. The two scones arrive, already halved and dressed with a skerrick of jam and lashings of sweet cream. It’s Monday morning and I’m surprised that the scones aren’t fresh as they arrive stone cold and stale, most unappetising. The best thing is definitely the cream, although I remove three-quarters of it. The historic village of Rockley is a quiet haven 20 minutes drive south of Bathurst. Part of Budden’s Guesthouse, The Tea Room, located in the former Rockley Bank that was built in 1872, was once the changeover stop for the gold coach that carried gold from Burraga to Bathurst. The Stable Block and Coach House on the same property also acted as the stopover for Cobb & Co coaches on the same route, so the property is oozing with history. You can sit out the front or within the beautifully renovated banking chamber for morning or afternoon tea. The host brings me an oversized tray containing thimbles of unusual teas such as Buddhas Tears (white tea buds rolled in leaves). It’s a difficult choice so I basically close my eyes and choose. The scones are a little dry on top and could be warmer. The jam is your usual suspect and the cream is freshly whipped. Open on the first full weekend of the month to coincide with the Bathurst Arts Trail. Tea: A huge variety of loose-leaf teas, but a little light on the tea leaves. Overall: Quiet historic village and tea room. German chef and owner Ralph has a very relaxed and casual approach to his business. So much so that it’s important to call and let him know that you’re coming to dine. Usually only open on weekends, it’s a pleasant place for lunch or a Devonshire Tea. If it’s not on the menu that day, just ask and I’m sure Ralph would be happy to rustle up some scones. 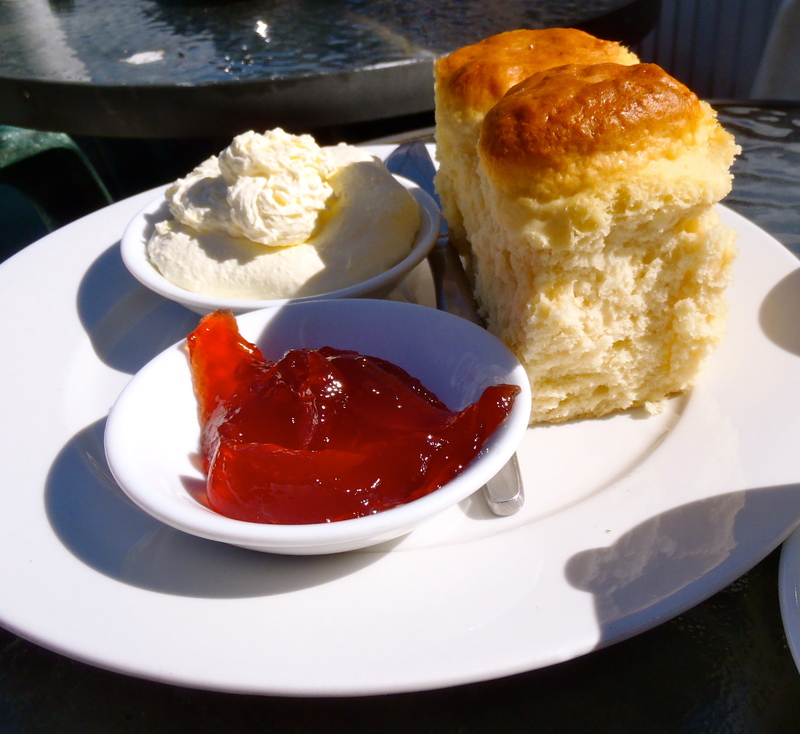 The three small scones are crispy on the outside and light on the inside, and are served with a tasty homemade jam and lightly whipped cream. A nice way to end a stroll around the historic Sofala township. Definitely call if you decide to visit. Tea: Some herbal tea varieties available in a huge pot. Overall: Great old cafe but call to make sure it’s open and they have scones on the menu. Kim’s Country Coffee is slightly kitsch, and because the space is quite large with high ceilings, it misses out on a cosy vibe. Taking up a corner shop, the cafe is light and affords plenty of views out to the street. 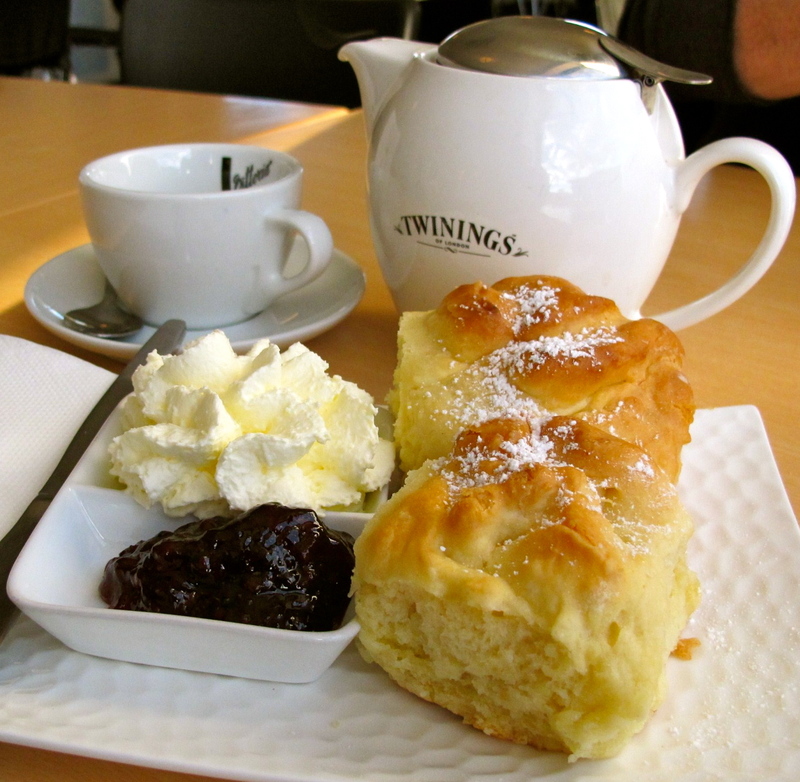 The Devonshire Tea is nicely presented and the scones look really good but you can taste a slight microwave flavour. I think fresh out of the oven they would be a five out of five. The raspberry jam tastes good but the cream is too light and airy. I love the big pot of tea that you can linger over whilst you stare out of the big picture windows. Tea: A selection of black and herbal loose-leaf teas. Overall: Simple country cafe which is surprising. I’m not a fan of Muffin Break, so I was surprised when I actually looked at their menu one day during one of my visits to Bathurst. Not one to forgo an opportunity to add another Devonshire Tea experience to my belt, I swallowed hard and placed my order at the register before slipping into the goldfish bowl seating area smack bang out the front of Woolworths. 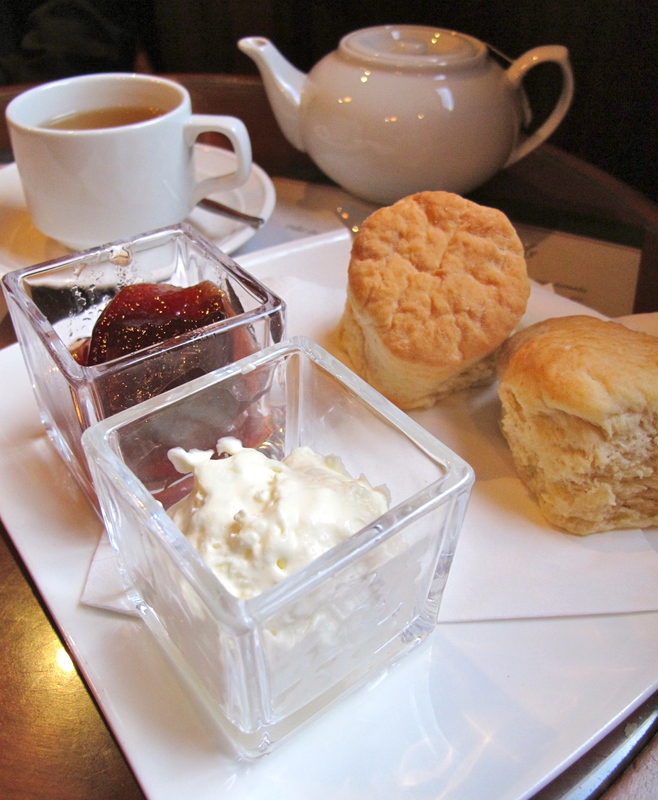 The Devonshire Tea arrived with no great aplomb, but what did I expect? The scones were dry, too sweet and tasted almost bread-like rather than fluffy scone, and the jam – you know how I feel about portion controlled packets – just pure lazy. Surprisingly the whipped cream tasted good, although it was haphazardly deposited on the plate. I gave it my best shot, but am embarrassed to say that I left the plate looking a bit like a dogs breakfast. Tea: A cup of tea with a few varieties of teabags to choose from. Overall: Forget it – give it a wide, wide berth! Established during the 1850s gold rush, Sofala is touted as the oldest surviving gold town in Australia. More a sleepy village than bustling business centre these days, Sofala is a pretty village that still attracts the odd fossicker to try their luck in the Turon River. Crammed with unique historic buildings, Sofalas’ standout properties include the Royal Hotel and the Old Sofala Gaol, that is more museum, shop and cafe than eerie gaol. The Old Sofala Gaol Cafe is cosy and warm on this winter’s day. 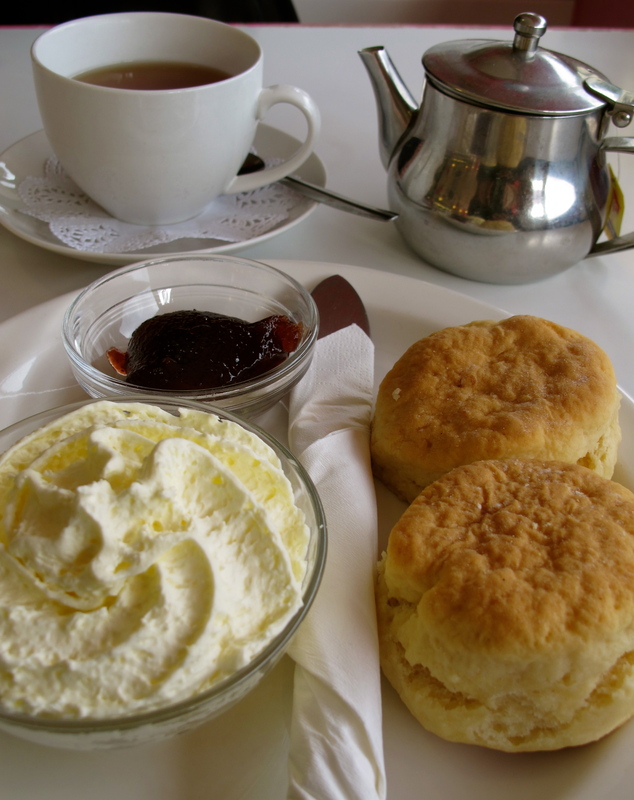 Rather than stay stationary waiting for the Devonshire Tea to arrive, potter around the museum that houses a large collection of memorabilia from many locations as well as from Sofala’s early days. There’s also a room full of collectibles to rummage through. The original police residence has been transformed into a Bed & Breakfast, and offers four rooms and for groups, the old Joe Yates cottage across the road is available. The menu lists plain and date scones, so naturally I try one of each. The presentation on a breadboard with a garnish of strawberries is impressive, however the scones are tough, probably from being over heated. The jam is forgettable but forgivable due the lashings of slightly sweet whipped ‘real’ cream. Open Friday to Monday. Tea: A small range of loose-leaf teas from Fish River Roasters is served in a pot. Overall: An historic landmark in a former gold rush village. Porters Cafe is a busy breakfast and lunchtime cafe in the heart of Bathurst’s CBD. The decor is simple and the bad acoustics making it very noisy if you are looking for a quiet chat. 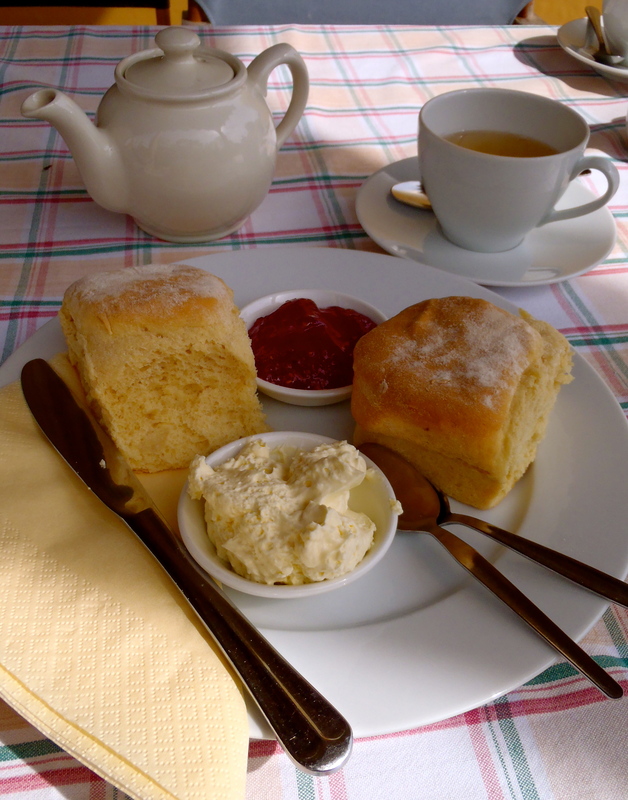 The scones are slightly sweet and crusty on the outside and served with a good-sized pot of tea. The jam is the stock standard strawberry variety but the cream is nicely whipped and creamy. Make it for morning tea as the cafe closes early. Overall: Nothing extraordinary but why not! It’s mid morning on a Saturday when we pull in to Sofala Souvenir Shop for an Evanshire Tea, the Devonshire Tea you have in the Evanshire council. The scones have literally just been pulled out of the oven and are steaming hot, fluffy, and for me, the perfect scone. We sit outside in the warm autumn sun and enjoy the relaxed vibe of this former gold mining town. Unlike Hill End 30 minutes drive away, Sofala is a compact village with most of the buildings, mainly private homes, concentrated on several blocks. The scones are so exceptional that I forgive the surly service, the plastic chairs and the synthetic looking and tasting jam. The cream isn’t too bad, and could be thicker. Tea: Just the standard black teabags available. Overall: Nice to sit outside on a sunny day. Overall: A tranquil bush setting, which feels a long way from anywhere! 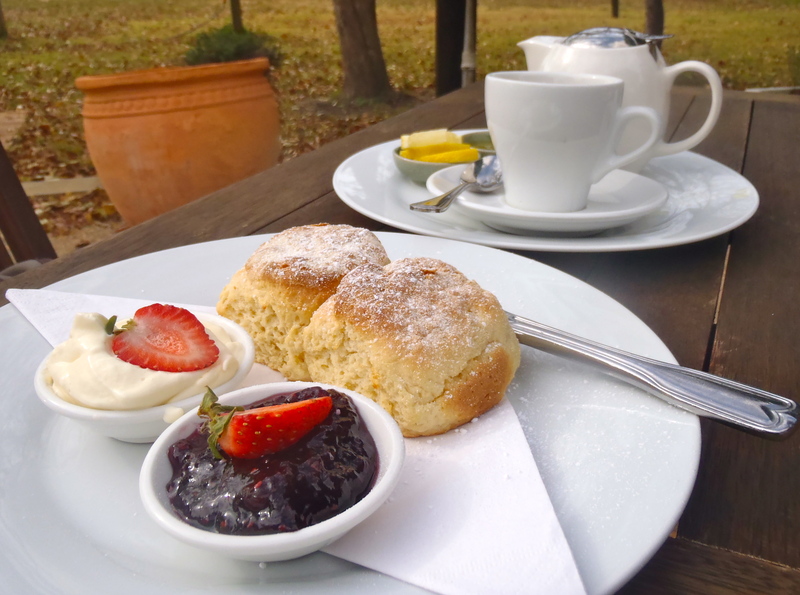 Conveniently situated next door to the Cowra Visitors Centre and the Cowra Rose Garden, the Coffee House gets its fair share of trade from those who are after good old-fashioned food rather than McDonalds. So what you’ll get here is a no nonsense Devonshire Tea with plenty of standard strawberry jam and light can-whipped cream. The scones are a good size but are neither exceptional nor bad. 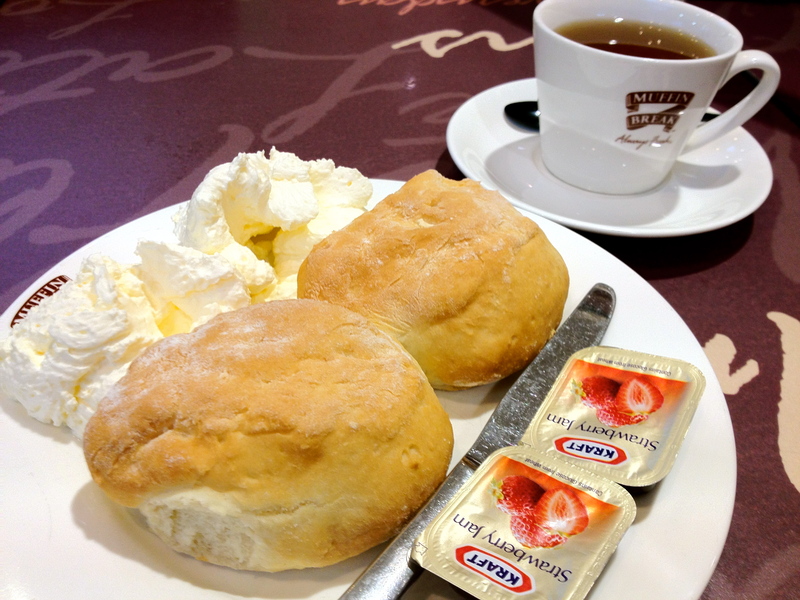 A good solid Devonshire Tea to keep you going n the road trip. There’s a choice of indoor and outdoor seating too. Tea: A small choice of teabags. Overall: Not a bad spot to take a break from the road. Tea: A variety of Morgan’s loose-leaf teas served in small pots. The Farmhouse Lollybug must be doing something right as the place is always packed on weekends, and I notice that it’s a favourite for groups of motorbike riders. I drop by at lunchtime on a Sunday and the scones taste like they’re straight off the baking tray – I can’t contain my excitement. Just how I like them – soft, fluffy, almost creamy. The jam is better than most and the cream is freshly whipped. The cafe/shop is the first cafe you come to if you’re heading west, down the Mt Victoria Pass. If the scones are always this good, it shouldn’t be missed. Tea: Small pot with a choice of teabags. Set halfway between Mt Victoria and Lithgow, and just before the turn off to Jenolan Caves on the Western side of the Blue Mountains, the historic Hartley village is a well-preserved reminder of 19th century rural Australia. One of the first settlements in the area, there are 17 buildings to explore and the oldest, the extravagant sandstone Greek Revival Courthouse built in 1837, once sentenced thieves, robbers and convicts in its heyday now acts as a museum. Nowadays the village is ghostly quiet, and more often than not you can have the place to yourself and your thoughts with only the rumble of traffic rushing by on the Great Western Highway. Recently a revitalisation project was established and already two businesses have moved in – The Talisman Gallery and The Old Hartley Post Office Cafe. 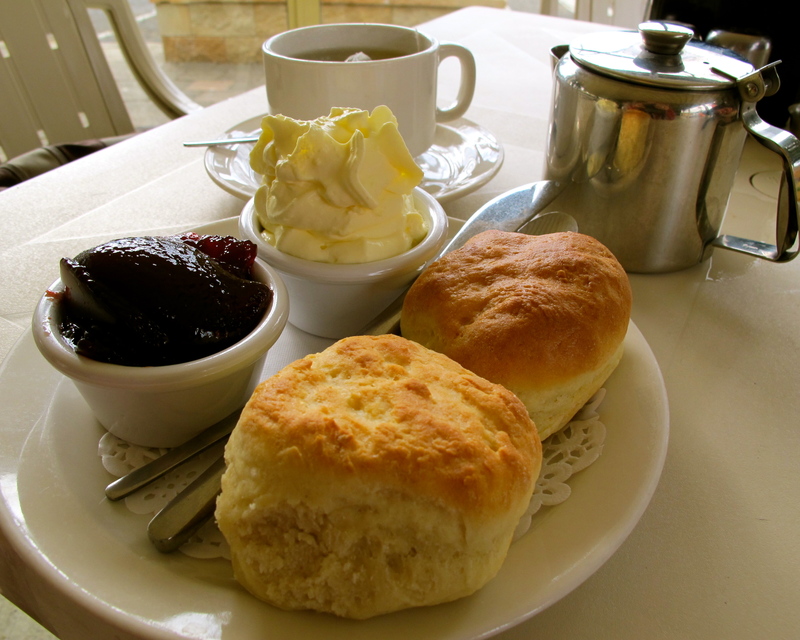 The latter is where you’ll find simple homestyle meals and snacks and a Devonshire Tea like your Nanna would make. The cafe occupies the old post office, which is beautifully restored and offers cosy indoor and sunny outdoor seating on the front verandah. The scones are the winners, small but soft with a creamy texture. The strawberry jam is average and although the cream is freshly whipped its super duper light especially noticeable if you prefer your cream more towards the clotted cream end of the spectrum. The cafe is open Friday to Sunday and for guided tours of the courthouse contact National Parks & Wildlife Service. Overall: A step back in time. Wallerawang is not a town you’re likely to divert through, unless there’s an accident on the Great Western Highway. The billowing stacks from nearby power station doesn’t paint a pretty picture. I do a drive through on a camping trip between Newnes and Hill End, stumbling across a great little antique shop and the wonderfully renovated railway station. Old Wallerawang Railway Station houses a small art gallery, lolly shop and a cafe where you can sit in the sunny front verandah or on the deck overlooking the platform and railway line. The scones are pretty good, given a quick blast of heat to freshen them. 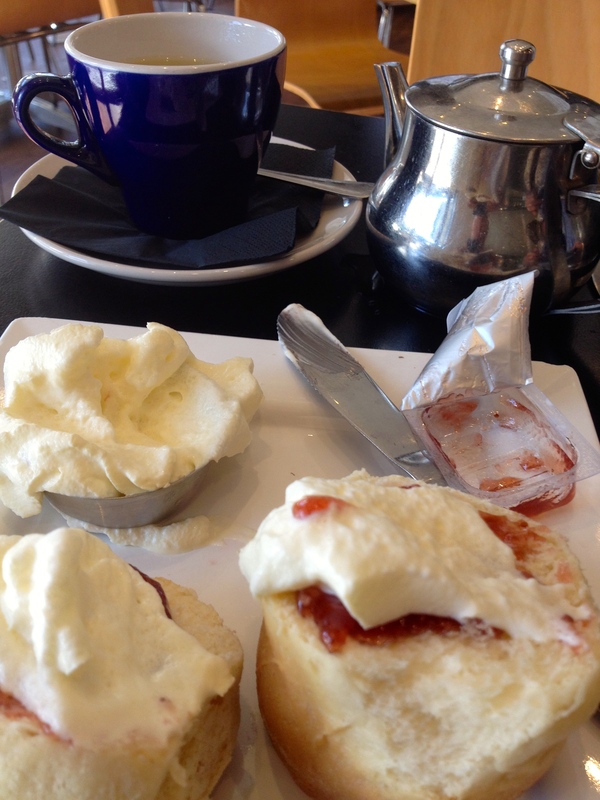 I am most impressed with the clotted cream and the homemade jam. Personally, I don’t care for whole strawberries in my jam, but this has to be one of the fruitiest jams I have come across. I’d suggest a double portion of the jam though as there isn’t enough to go around. 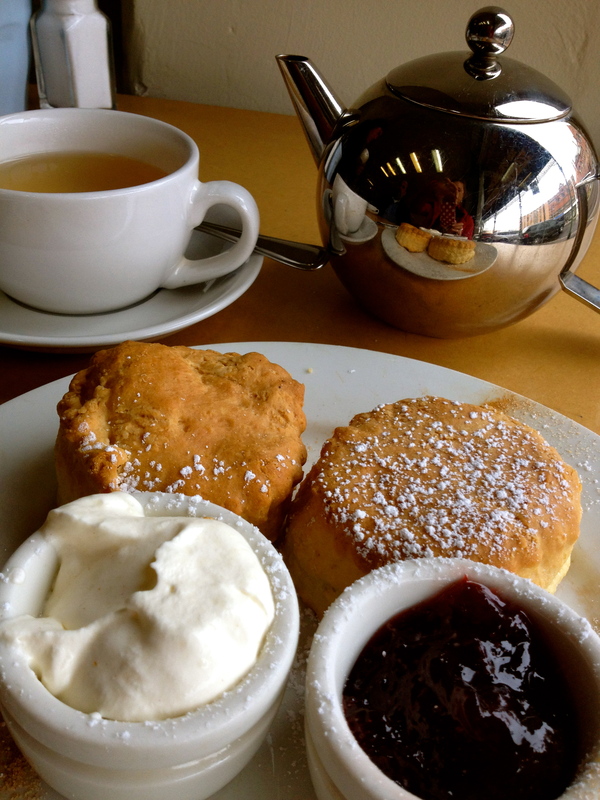 The Wollemi Bakery and Cafe is the only cafe in town that the Lithgow Visitors Centre could point me to that ‘might’ have scones – it’s a 50:50 chance really. Although the cafe is huge, at lunchtime it’s hard to find a vacant seat. Apart from the bakery/cafe kitchen in one corner, another corner houses Treasures Giftware and another area is designated to a kiddies playground. It’s not hard to gather who the clientele are, but on this Friday lunchtime there are as many men in high-vis clothing as there are women with kids. Although there are scones, there are no DTs as such on the menu, but I make sure that there is a jam/cream option before ordering. Choosing the plain scone over the date, I ask for no butter (or rather margarine) and for it to be heated. When it finally arrives it is already coated in margarine, average jam and a squirt of sickly sweet cream from an aerosol can – you know the one. The scone is cold as it’s been sitting in the cake fridge, and reminds me of the scones served in England, although they are at room temperature. It’s an inexpensive option if you are hankering for scones and the rest of your party want a pie or hamburger. Overall: A lively bakery cafe with an allocated corner to keep kiddies amused. An old gold mining town and one of the former homes of poet and writer Henry Lawson, Gulgong’s well-preserved architecture easily transports you back to its heyday in the 1800s. The small town just outside of Mudgee still supports four pubs and has the oldest continually operating opera house in the country – the Prince of Wales Opera House. Upon entering Mayne Street you’d be forgiven for feeling you should be either on horseback or in a carriage, it’s that sort of place that evokes these kinds of whims. I love the former Gulgong department store facade that now houses the IGA, and the countless decommissioned pubs that now function as other businesses. There aren’t too many cafes in town, so I am pleased to stumble upon the Butcher Shop Cafe (although not to be mistaken for Mudgee’s Butcher Shop Cafe). It doesn’t look as though it was an actual butchers shop, although there is a vintage ‘Butchers Shop’ sign hanging from the ceiling, and other random antiques. 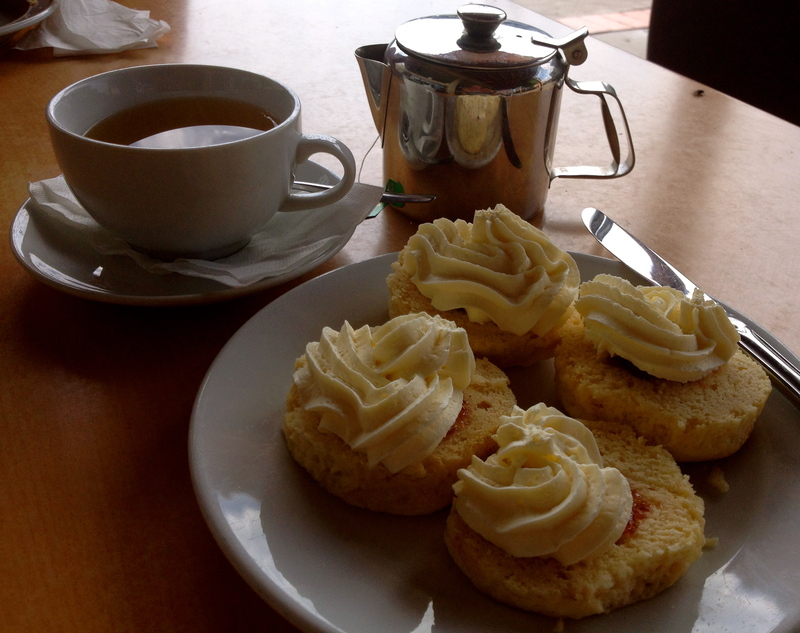 Regarding the scones, they are a bit cake-like in consistency although soft and creamy. They’re also quite big so there isn’t enough jam and the super light cream doesn’t do the Devonshire Tea justice. I was also hoping for something beyond a Nerada tea bag, which isn’t quite strong enough for a teapot. Tea: Five choices of tea bags served in a good-sized teapot. Overall: It’s the only place in town that has scones daily. It takes me a few minutes to find the ‘scones, jam and cream’ on the busy blackboard menu. Spacious and furnished with tables suitable for sharing or for parties larger than two, Cafe on Louee also has tables on the footpath and in the narrow courtyard that are more suitable for twosomes. Like many cafes in this neck of the woods, there is giftware for sale for shopaholics in need of a hit. When my scones land in front of me, a passing posse of women excitedly exclaim “oh scones,” just to reiterate to my reluctant tasting partner how popular they are. Surprisingly I am not asked whether I want a pot or cup of tea (I didn’t realise there was a choice), so my Lipton green tea arrives as a cup of hot water with a tea bag on the side. The scones are quite big, and there could be a bit more raspberry jam, although they have outdone themselves with the quality and quantity of the thickly whipped cream. Breaking the scones in half, I find the top half tastes markedly better than the slightly drier bottom half. The scones are sitting in the fridge, but I think if they were fresh from the oven they would have been hard to beat. Tea: A selection of tea bags that’s either served in a cup or a teapot. Overall: Great for groups who like a bit of gift shopping on the side. I walked past Gulgong Sweet Delights on a previous visit to Gulgong where I stared forlornly at the ‘Devonshire Tea’ sign in the window. In small print it read ‘on Wednesdays and Weekends’, that was a Friday. So here I am again on a Sunday to try their sweet delights. The place is more shop than cafe, with lots of pewter condiment and salad spoons with gumnuts and koalas on the handles for sale and some second-hand clothing, shoes and books. There are jars of lollies and ice-cream sandwiches, and a few other items alongside the Devonshire Teas available. It’s all quite rustic and we choose a seat in the courtyard to enjoy the spring sunshine. The $6 spread has all the trimmings: butter (if you are that way inclined), rich raspberry jam, clotted cream and a wedge of lemon for the tea in case you don’t take milk. I have to say that I am immensely impressed with the cream. 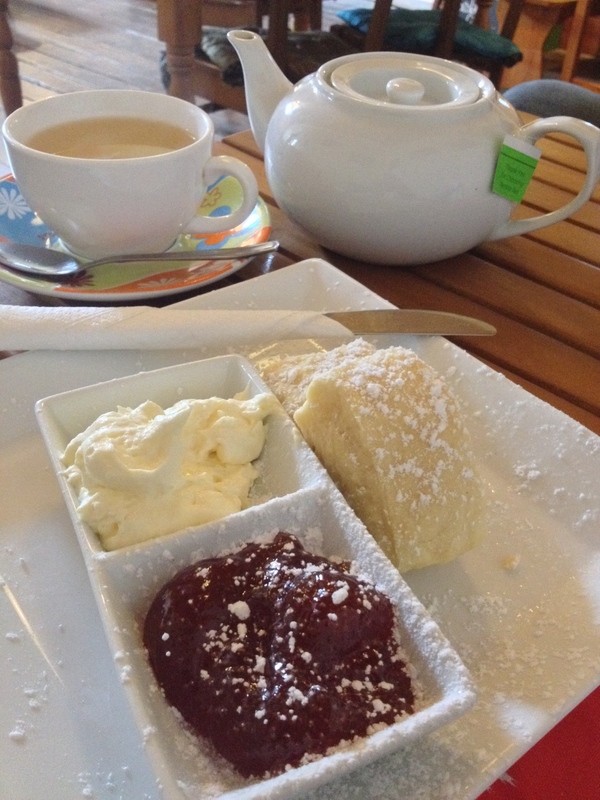 It may not be your British standard clotted cream, but it comes pretty close for us Australians. The only downfall is the scones, which is a real shame. They are stone cold and could do with a blast of heat to soften and bring out their flavour. Tea: A pot of black loose-leaf tea with an extra jug of hot water for topping up. Overall: Absolutely brilliant, but hopefully the scones are usually better. 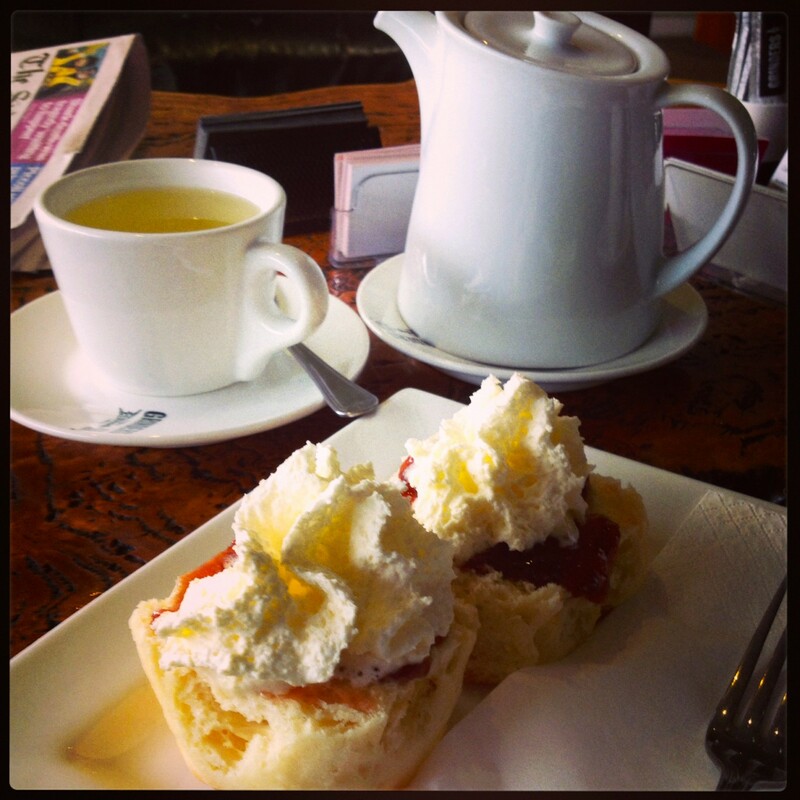 It’s strange to be ordering scones in a Brewery but it’s too early for booze and, why not? Mudgee Brewery has been brewing beer at this address since 2007. I happened to be in Mudgee that year and whilst walking past the building, which used to be an old Wool Store, I popped in to check it out. The new kid on the block was an empty shell with only a bar, a few stools and copper and stainless beer vats behind the counter. It was only early days but it didn’t take long before the space was filled and it become a ‘must do when you’re in town’ sort of place. 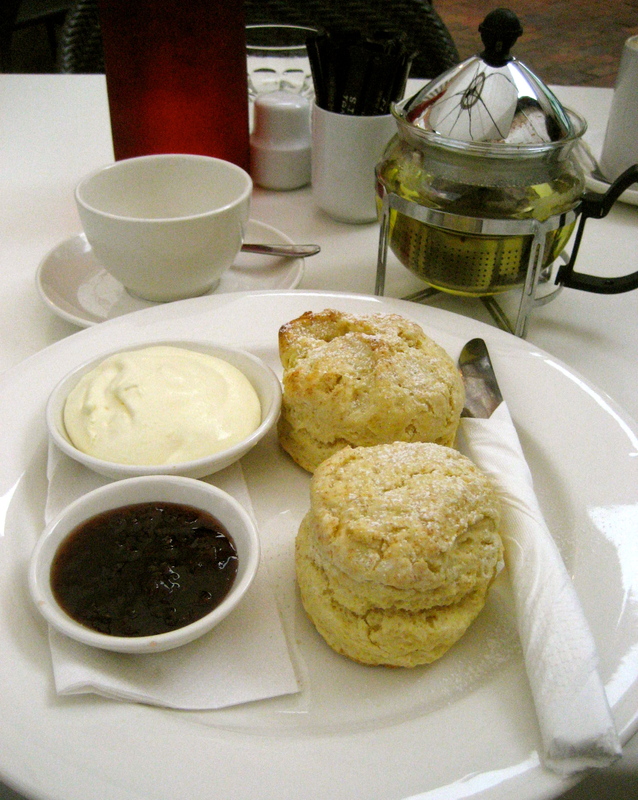 The scones are fresh and crispy with excellent quality jam and cream. However, you may have to ask for more jam as it’s not only yummy, there just isn’t enough. Tea: A good variety of loose-leaf teas in a large pot. Overall: Odd place to have scones, but it’s the perfect solution to keep both him and her happy. You have to first know where Mudgee’s Quaff Shop Cafe and Gallery is, unless you’ll never find it. A big country block from the main town centre and opposite a high school, this unassuming group of businesses sharing an historic former business or residence (?) is a special find. I’m a fan of the renovated as opposed to modern shiny and new, it figures why I’ll soon be living part-time in a 1920s train carriage not far from Mudgee. The Quaff Shop’s well weathered floor boards are impressive, but I’m not sure who butchered the ceilings? Two large dining rooms and a shady courtyard out the back plus a few tables on the footpath, this place undeniably has soul. If it’s shopping you’re after, there’s a rack of preloved funky clothes, plus art, candles and jewellery for sale. It must be a favourite for Mudgee mothers as there is a corner dedicated to kiddies toys but was thankfully silent when I visit, leaning more towards a senior clientele. 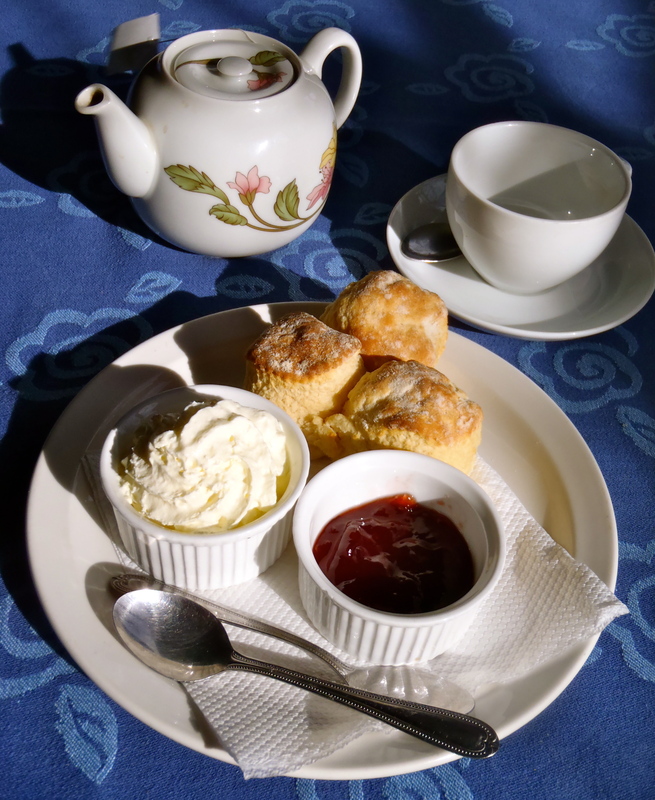 The young staff is cute, friendly and efficient and the scones are scribbled on the ‘sweet treats’ blackboard menu, so call before a visit if it is just the scones you are after. This Devonshire Tea is definitely a snack. The two scones are literally bite size but are fluffy and rewarding nonetheless. It’s a tad on the sweet side with the amount of icing sugar sprinkled on top of the jam (that’s average) and the slightly sweetened freshly whipped cream. Tea: A small variety of tea bags served in a good-sized pot. Overall: Quirky backstreet cottage that is worth a look in. The Cobb & Co Court Boutique Hotel is situated in the heart of Mudgee and in spitting distance of at least 40 cellar doors producing some pretty special drops. It’s a fine place to base yourself as everything you need; restaurants, pubs, cafes and shops, are all a short stroll away. The Hotel’s restaurant, The Wineglass Bar & Grill is open pretty much all day, and when I visit, the courtyard is awash with warm winter sun. There are umbrellas for shady outdoor dining in the summer and indoor seating for the cooler and warmer weather. 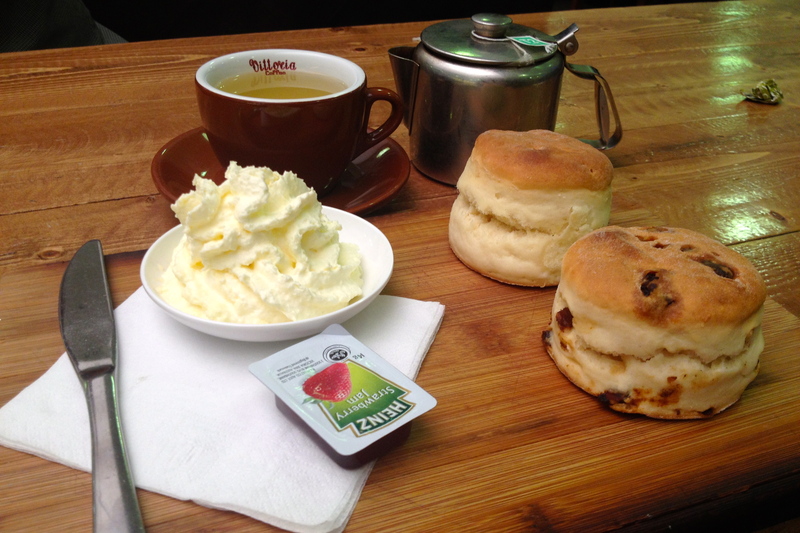 Just so you know, the scones appear on the breakfast menu, which finishes at 11am. My visit coincides with lunch, but an okay from the kitchen assures me that scones can be had all day. You can order a full or a half serve, but I must point out that the scones are small, almost bite-size, and unless you’re on a diet you won’t want to share. The scones are straight out of the oven, crispy on the outside and soft and piping hot on the inside. The jam is quite average considering the cost of the scones and the fact that Mudgee has traded its country image for a food and wine haven. It says double cream on the menu, which to me means thick dollop cream, but this cream is nothing like it although fresh and lightly whipped. Tea: The usual range of tea bags served in a small pot. Overall: A lovely little courtyard cafe to escape to. I must admit, since my last visit in 2009 Caves House is looking tired and in need of some tarting up. It also feels much more family orientated than romantic couple getaway by the looks of all the children at Jeremiah’s Bar at afternoon tea, and especially at the breakfast buffet the next morning, which resembled a mad house. I am sure Jeremiah Wilson, after which the bar is named, wouldn’t be too impressed either. He was The ‘Keeper of the Caves’ and the first official Jenolan Caves guide who was known as an eccentric character very fond of the ladies. I just can’t shake the feeling that tucked away in the corner I don’t feel any of the 1897 grandeur. My scones take a while to arrive, only because they have been in the oven. Even though they aren’t impressive to look at, they make up for it in taste. The jam and cream suffice, and although the cream is light, a bit more whipping would have helped. From 3 pm to 5 pm daily. Tea: A basic variety of teabags in a good-sized pot. Overall: More family cafeteria then historic cafe/bar. Several years ago, I sat in almost the same seat in this very same building eating scones. Back then it was called Cafe Savannah, but now with a new lick of paint it’s known as The Long Arm Farm Cafe and Produce. In one corner, shelves are stocked with homemade jams such as yellow cherry, sour plum, peach, strawberry, mango, plum cherry and fig – the list is endless – plus chutneys and honey. It’s a popular spot and I don’t recall the very-cold-in-winter-town of Oberon being so busy. There’s a table of sweet treats, including a cake stand full of scones. Although they look good, the scones are like rock cakes and particularly dry. It’s a hard choice with the jams but I settle for something slightly different, the nectarine jam, which is quite syrupy. The cream is super light and sweet, and it’s very kind of the staff to voluntarily bring me more. 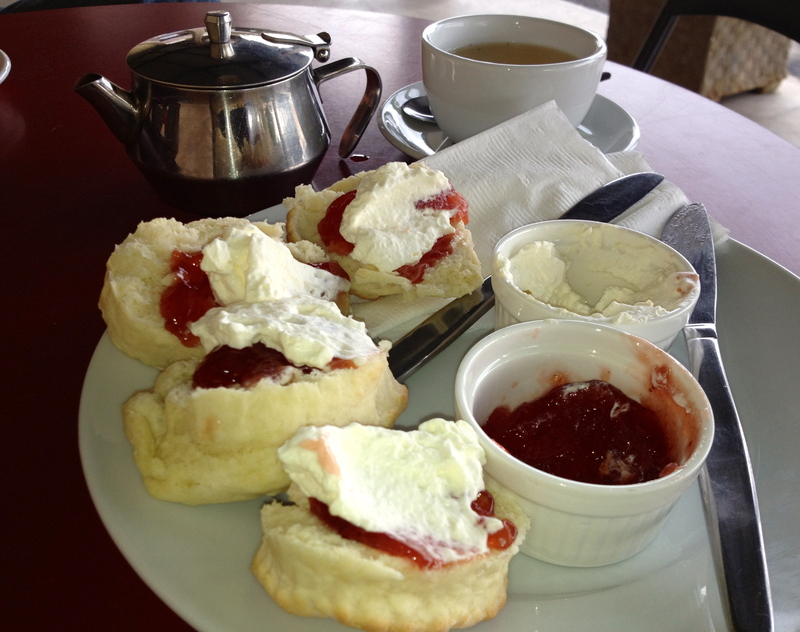 I really need extra jam as well; the dishes are thimble sized plus the dry scones need a bit of help today. I do have a gripe, and it’s about having to pay for a pot of tea that’s only half filled with water (and the teapot isn’t particularly big). Seriously folks, it’s only hot water! Tea: Four standard choices of organic loose-leaf tea served in a pot and a pretty dainty teacup and saucer. Overall: A relaxed vibe with lots of take home edible goodies. When I was looking for the Anson Teahouse I was expecting something a little more cosy and cute, no wonder I almost walked straight by. The cafes narrow shop front looks like a no frills cafe and I find the title unfitting. There are a few tables outside, but most seating is inside occupying the long narrow and simply decorated space. 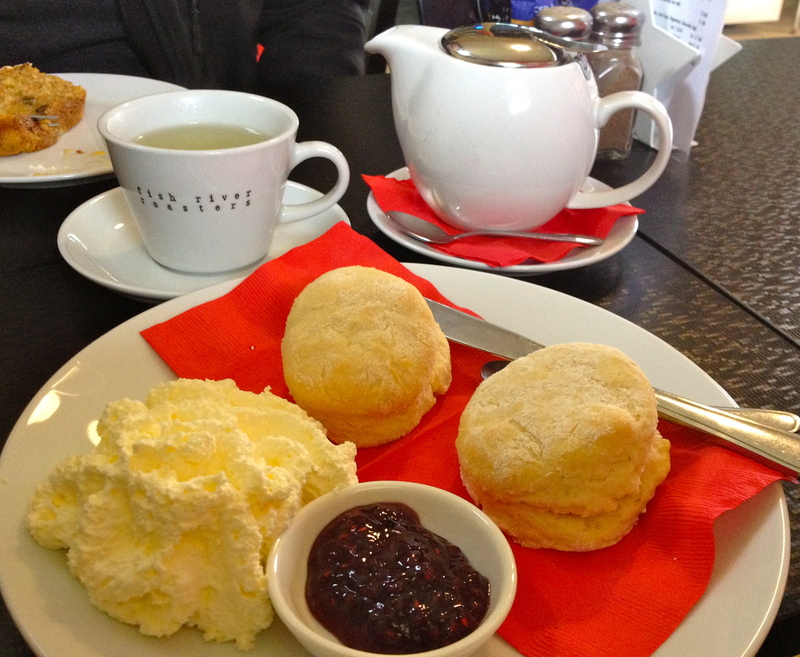 I end up with two scones, although I spy a lady at the next table that has opted for one. The scones aren’t bad, but a bit crumbly, and I struggle to keep my plate from looking like I am deliberately playing with my food. As the scones are quite large, the servings of jam and cream are too small, and the cream although freshly whipped is too light for me. Considering the name, the only signs of a teahouse are the row of tins of tea and a teapot sitting on a shelf, otherwise the cafe is more fitting for bacon and eggs. Tea: A selection of loose-leaf teas and tea bag teas served in small pots. Overall: The term ‘teahouse’ is a little misleading. Cafe Latte is a popular cafe smack bang in the middle of the busy main shopping drag in Orange that tends to draw in the shopping crowds. Large yet cosy with seating on the footpath as well as plenty inside for the cooler months, the place is a pleasant stop for a meal. I can’t really promote the scones, as they are pretty ordinary, brought in rather than baked on site. You can order as many as you like as there is no ‘Devonshire Tea’ package, and they come already halved with the jam and cream on top. 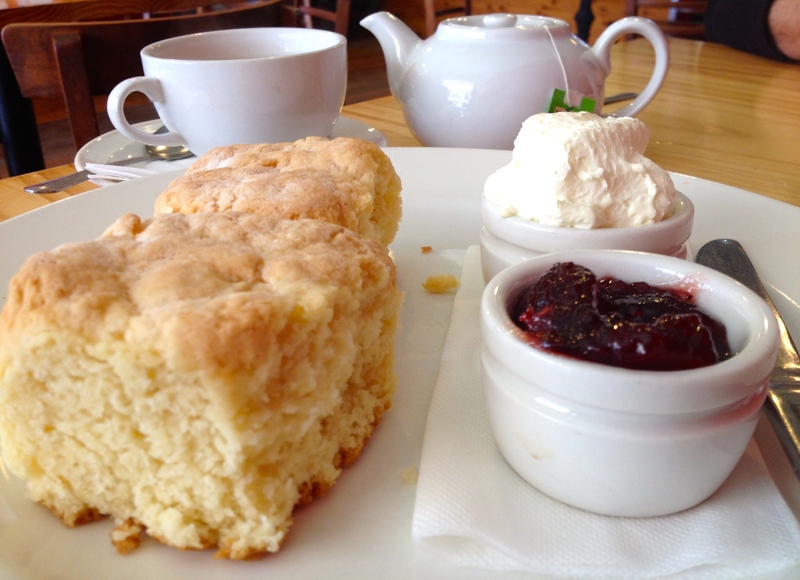 The scone is rather sweet and not particularly light nor fresh. The jam is the stock standard variety and the aerosol-canned cream dissolves minutes after I receive the order. Do I need to continue? Perhaps try something else on the menu. Tea: T2 teabag served in a large pot. Overall: Comfy and popular cafe on the main strip. The Dotted Eight Cafe is situated down a quiet street off the main drag in Orange’s town centre. When I am there, I’m not sure what the ‘studio’ part is about because it doesn’t look arty at all, if anything, it’s quite the opposite. It’s after I have a peak at the web page and learn that the ‘studio’ refers to a professional acoustically designed recording studio. Maybe that’s out the back, or maybe I am sitting smack bang in the middle of it as I see an old school piano that reminds me of music lessons back in the 1970s. 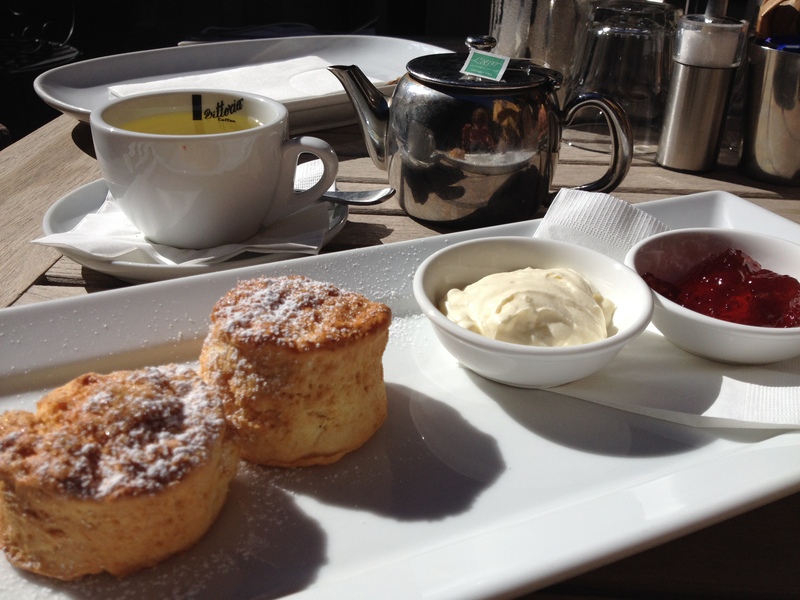 Wherever it is, I don’t care, as I am here for the scones, and I see them sitting snugly on a cake plate. The scones look fresh and appealing but are a bit tough when I bite in to them. I have a second opinion from my tasting companion and he agrees. The jam is average and the cream is freshly whipped although a bit airy. Tea: A choice of loose-leaf T2 teas including Chai. Overall: Friendly staff and pleasant. 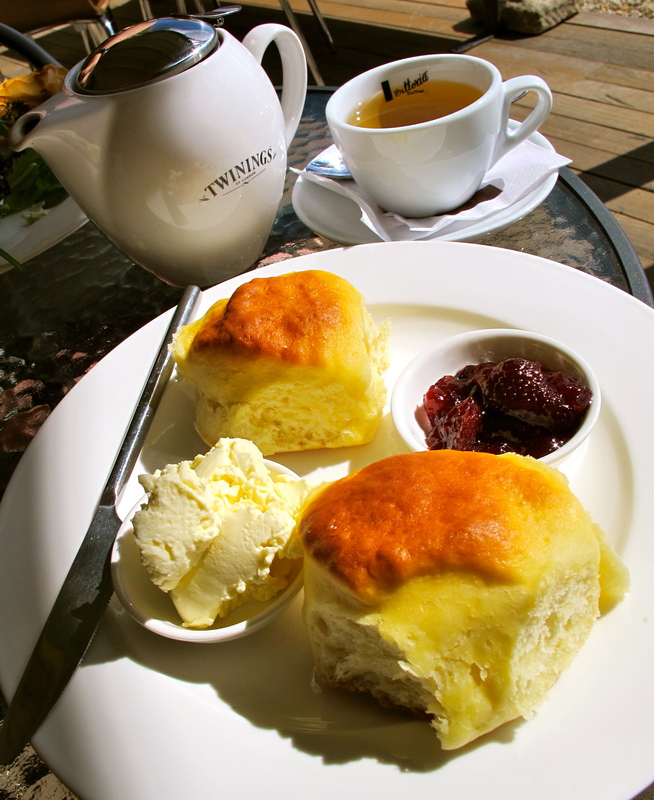 I have broken scones at Mt Canobolas Tea House on many occasions, namely under the reign of the long-standing owners, which was also before it briefly became Miss Daisy’s Tea House (I somehow missed that era). The interiors feel brighter after being spruced up with a few new touches here and there, but other than that the exterior remains the same. My visit coincides with a bleak wintry day so diners are inside hovering around the fire. In warmer weather when the gardens are in full bloom, tables are brought out in to the sunshine, or shade, depending on your preference. Mt Canobolas on the outskirts of Orange is an outdoor playground for the locals, so needless to say, the tea house is well patronised. I’m also equally glad the latest owners have decided to keep scones on the menu. 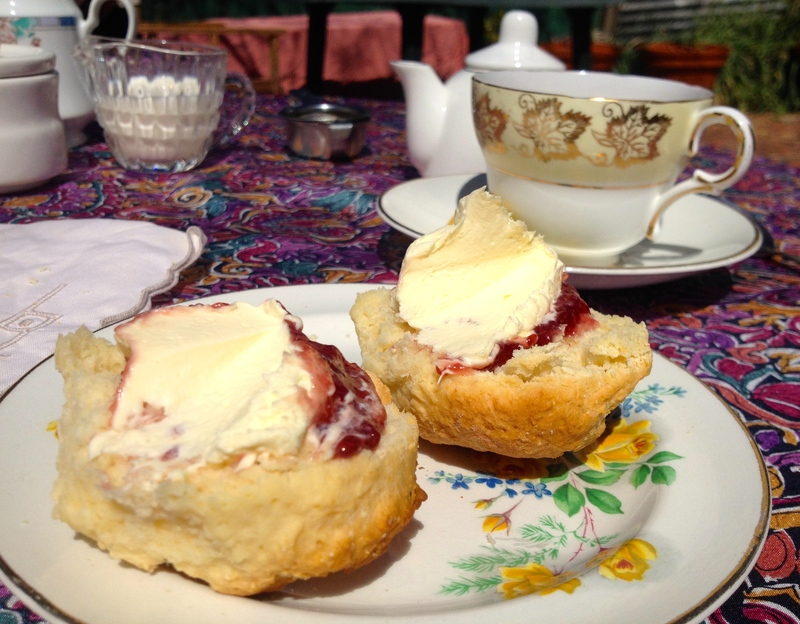 A tea house is not a tea house without scones, right? 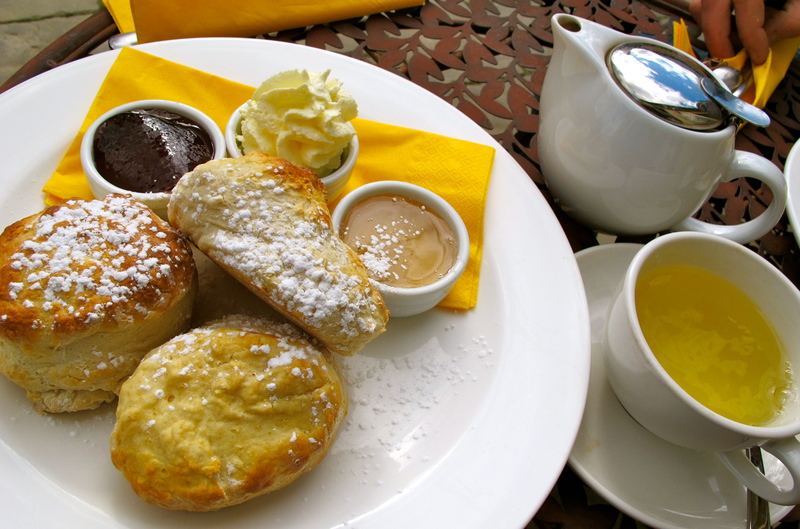 The scones are superb: fresh, light and creamy on the inside and encased in a delicate crispy shell. Truly exqusite. On the other hand the portions of jam and cream are frugal, and I can’t comprehend why the jam is of average quality? There is a stack of quality jams for sale, so why not showcase them? The cream too is below par; mine is almost dissolving in the tiny dish it arrives in. A shame as the Devonshire Tea would be an absolute winner if the cream and jam were up to scratch. Tea: A range of Tea Drop pyramid tea bags served in a good-sized teapot. Overall: The Tea House is a favourite at anytime of the year. I’ve said it before and I’ll say it again. I’m not a fan of cafes in shopping malls unless the said food court resembles the one in Westfields Sydney. With this in mind I swallow my reservations and try Peoples Cafe in Orange. I try both the plain and the date scones, and although they arrive looking cool on a breadboard, the presentation doesn’t make up for the fairly disappointing Devonshire Tea. The scones are bread-like with the plain scone tasting better than the date. It comes with one sachet of jam, which is lousy and not nearly enough, so I ask for another. The cream is definitely out of a can; tasteless and almost liquid by the time it hits the scone. I must say that it’s a comfortable place to be out of the 35-degree heat though. Tea: A limited variety of T2 teabags. Overall: Go as a last resort. I love exploring and digging around in historic buildings. It’s probably why I enjoy the Beekeepers Inn that was once a bustling Cobb & Co stop between Bathurst and Orange, used to change horses and for customers to rest. Nowadays, it’s still busy, but customers arrive and depart in their own vehicles after they are fed and watered. There are lots to do here while you’re waiting for your order to arrive. Antique aficionados will love the front room where you’ll find an interesting yet expensive collection of antiques, and everyone else will find gifts, olive oils and of course honey. 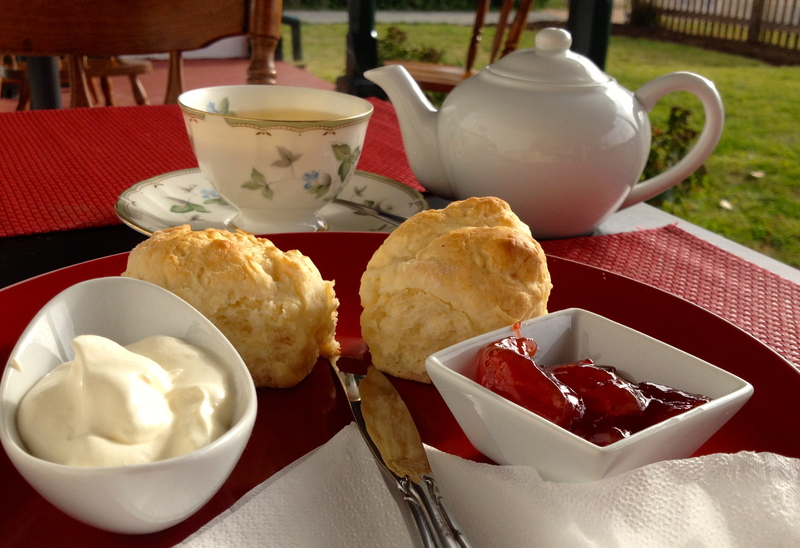 I have the Devonshire Tea out on the large deck under big Central Tableland skies. It comes with three smallish scones that are straight out of the oven and taste more like damper than scones. There is a serving of jam and of course honey, which gives it something unique, but I’m not impressed with the cream out of a can. It’s not called the Beekeepers Inn for nothing, so go ahead and taste the multitudes of honey. Tea: A range of loose-leaf teas. Overall: Food, shopping, tastings – what more could you ask for?